Join the Facebook group here! There'll be loads of regular chit chat during the league so join the group so as not to miss out! Welcome to the Newcastle Ultimate Draft League! We are now in our fourth year of running the draft league in the North East. - at Finals night we have a winner! Players of all experience and ability are welcome. All the stats for each player will be recorded throughout the league so we are able to award individual as well as team prizes. There will also be a fantasy league running alongside so you can earn points each week with further prizes available there. For more information, please continue reading below, or see our Frequently Asked Questions. The 2018 edition of the draft league will be back at Benfield Sports Centre with matches taking place on six consecutive Tuesday evenings, starting on 24th April. Draft Night will be Tuesday 17th April at The Chillingham in Heaton. 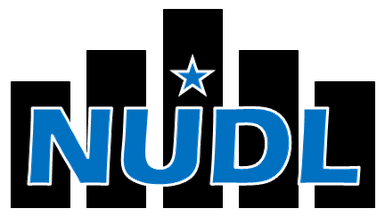 NUDL4 is a UK Ultimate sanctioned event so you need to be at least a 'basic' member of UKU. This shouldn't be a problem for the majority of people as you'll be members from your Uni and Club commitments anyway. If, however, you aren't currently a member of UK Ultimate, you will need to become one. This only costs £5 and you can do it here: https://www.ukultimate.com/join. If you have never played Ultimate before, you are able to attend 3 sessions before becoming a member. Your membership information will only be shared with UKU so they can check samples to ensure we are abiding by the rules! The draft league starts at Draft Night. All the players will get together for some drinks and there will be a series of rounds in which the team captains will choose players. Everyone will get picked, and by the end of the evening we'll know the make up of each of our league teams! Draft Night this year will take place in the upstairs room at The Chillingham (NE6 5XL). This is nice and close to the Chillingham Road metro station so easy to get to. There is a very tiny car park, but there are on street parking options nearby. The night starts at 8.30pm with the draft kicking off around 9.00pm. We'll split the draft in two so there is a break for people to head downstairs and grab some more beers. It should all be done, therefore, by 10.30pm, hopefully including a bit of time for the captains to get their teams together for a chat (if they want to!). Don't worry if you can't make it to Draft Night. As long as you enter before the deadline, you'll be in the draft and you will get picked! Teams will be mixed gender and the games should be mixed as far as possible depending on numbers. Team captains should decide before the game starts whether to play a full mixed 3:4 ratio or loose mixed 2:5 ratio. The ‘home’ teams will always play in light coloured kit (white where possible), with the ‘away’ teams in dark. Full WFDF rules should be used unless otherwise stated (please support those players who are new to the rules!). Week 1-5 games should be played to 13 points with a half time at 7; the time cap is 50 minutes. When the whistle sounds, finish the point before stopping. Week 6 games, the finals, should be played to 13 points with a half time at 7; the time cap is 50 minutes. When the whistle sounds, finish the point and add 1 to the highest score, then play to this score. Each team is allowed 2 timeouts per game. It goes without saying that Spirit Of The Game should be adhered to. Each team will be expected to record a SOTG score for their opponents on the score sheet, out of a maximum 10 points. The suggested process is for each team to start with 5 points and you then add or deduct points for good or bad Spirit, to a maximum 10 or minimum 0 points. These scores will be public so you should be able to justify your addition or subtraction of points. You will be expected to have completed the Spirit scoring before leaving the field each week. We will be taking stats for goals, assists and Ds. It is the teams’ responsibility to ensure stats are recorded correctly on the score sheets so please ensure your subs are taking charge! There will be prizes! Scorers on the sideline have to use their judgement to determine if a point for a D is awarded. NB a callahan score would score one point for the D (interception) and one point for the goal (but there would be no assist).